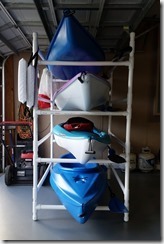 With our newly acquired kayak collection, storage has become an important requirement. While there are plenty of commercial solutions available, most are prohibitively expensive, difficult to use, or require large amounts of wall space. 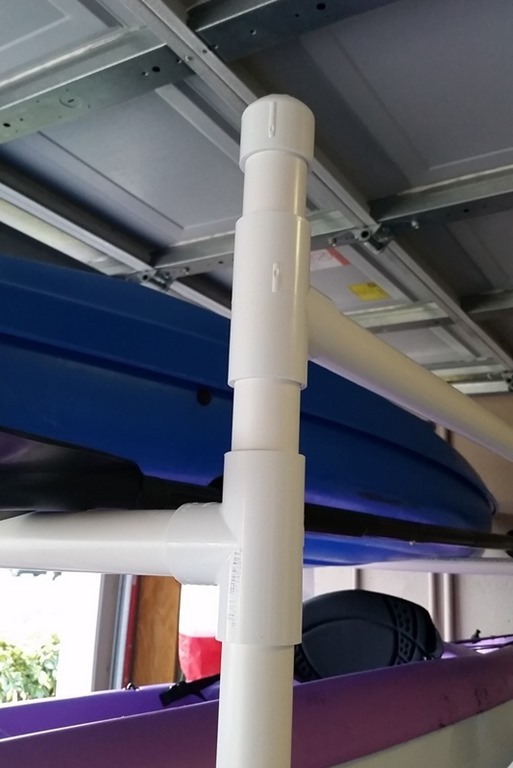 With a little digging on the net, I was able to find a relatively easy and inexpensive solution; PVC. 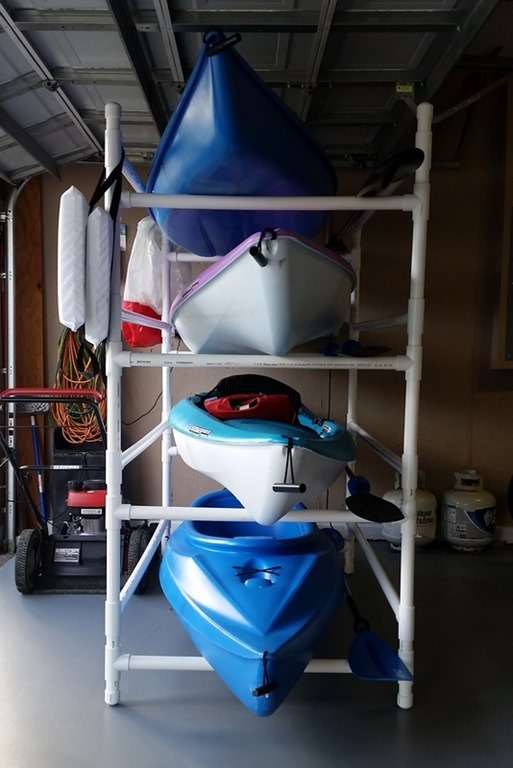 This rack is largely based on this one found on YakAngler.com, posted by FLNavyVet. I made a couple of changes. 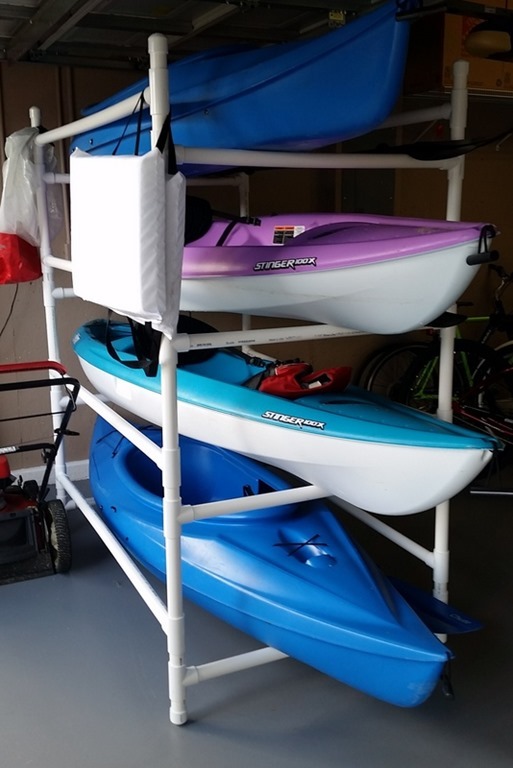 First, I went one level higher so that four kayaks/SUPs can be stored. Secondly, I used 1 1 /14″ pipe rather than 2″. This is more than adequate strength-wise and brought the total price down about $30 over the 2″. 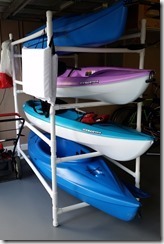 The rack easily holds our four 9 1/2′ and 10′ kayaks, as well as paddles, PFDs, and dry bags. If you don’t need storage for four, just reduce your shopping and cut list as follows for EACH level you are removing. I suppose you could also add for additional layers, but beyond four will get kind of wobbly. 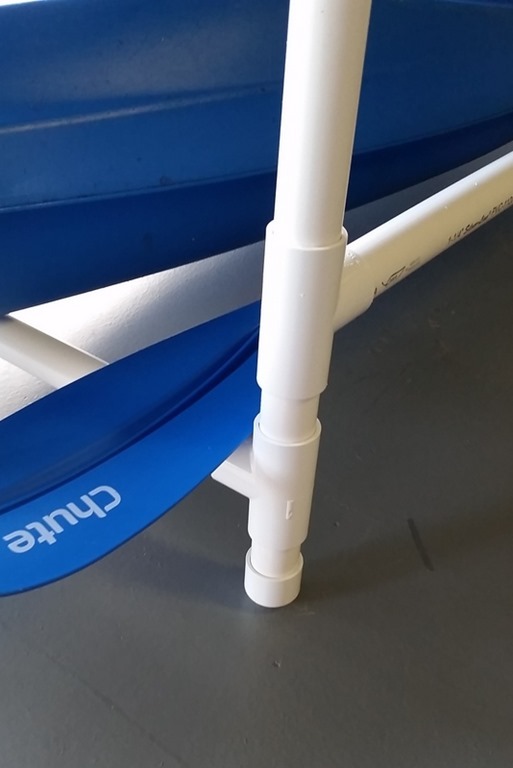 Putting the rack together is rather straight forward, basically each “leg” is assembled in the following order (bottom to top), with every other T at right angles. 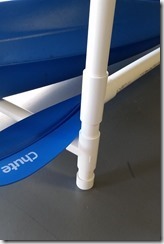 Then connect the legs alternating from the bottom the 36″ and 60″ pieces. I could have made my rack a few inches narrower. Doing so, would have provided a little more strength. 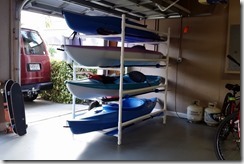 Measure your kayaks and adapt the 36″ pieces as needed. During my next trip to Harbor Freight, I’m likely going to buy some casters for it. 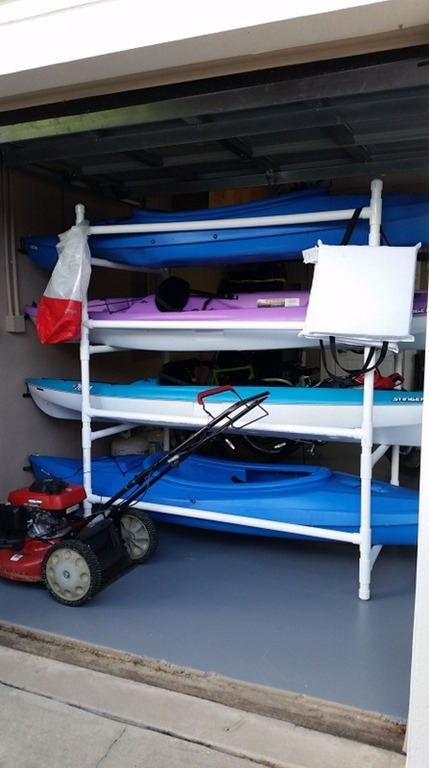 Being able to move it around in the garage would be very useful. did you glue your pipe? 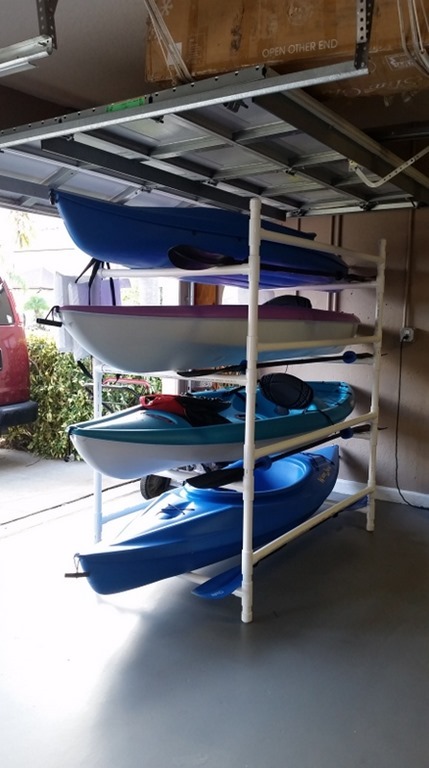 I glued only the bottom rack, so everything would hold its shape. Thanks bro. Just made mine with a couple changes. 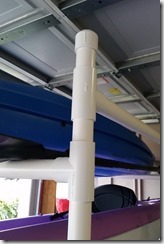 I went 3″ instead of 4″, 9″ instead of 12″, and 30″ instead of 36″. 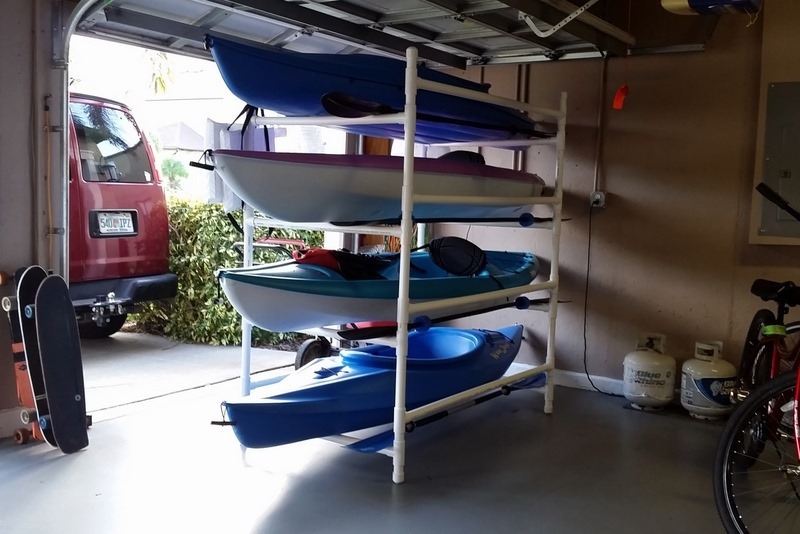 The opening for the kayaks are > 30 wide and about 15″ high. Overall height is about 66″. Thanks again!! Hi Brian – so were you able to buy less pvc? And if so, overall what did you buy? Thanks for the plans! Worked great!!! Thanks for the plans. I build mine roughly on someone else’s plan. I think doing a dry run without the glue is ok but go back and add it, another plan said you really didn’t need it. That is ridiculous, My lengths are 72″, 28″, 12″ (could have been 9″ or 10″), and 5″.